-- Select a Size/Color -- X-Small Small Medium Large - Out of Stock! X-Large - Out of Stock! 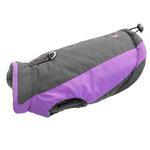 Weather the storms this season with the Trekking Dog Jacket by Gooby in Purple! Posted On 03/09/18 by Korena S from Portland , OR Yes, Korena S recommends this product! I love Gooby. They fit my cocker perfectly. Easy to get her in and out of and I love the ring for the leash. Posted On 02/12/17 by Lewis S from St. Helena, CA Yes, Lewis S recommends this product! I bought this in a size Medium for my small (not xs) chihuahua. I find even though she typically wears size small, when it comes to jackets or puffy vests she wears a Medium. 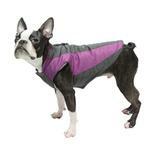 Be sure to measure your dog to fit the jacket measurements. Definitely go bigger. Consider if you had a thin fleece vest on underneath the jacket, and go a tad bit bigger for that. Don't get it to fit exact or it will be a little snug. 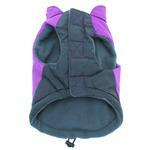 Its thick and puffy with a wonderful fleece lining. 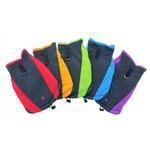 Repels water, super warm, and superb quality! I like that it has a leash hook as my dog has more freedom to snoop on walks without the restriction and pressure from hooking a leash to her collar. Posted On 01/17/17 by Maria N from Yorkville, IL Yes, Maria N recommends this product! Posted On 08/22/16 by Lisa K from Salem, OR Yes, Lisa K recommends this product! 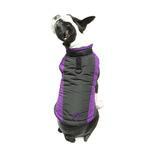 I bought this jacket for my 7 pound chihuahua and it will keep her toasty warm this winter. It's the perfect coat! Posted On 07/21/16 by Janet D from Rockaway, NJ Yes, Janet D recommends this product! 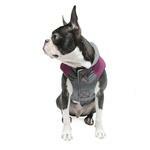 Cozy jacket, good fit, nice and soft on the inside, water repellent shell on the outside. Drawstring on the back tail ensures a snug fit. Good value, really love the lavender color! 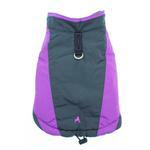 Pretty,fits well, most importantly keeps my baby pup dry and warm !! Posted On 09/21/15 by Deborah S from Vermilion, OH Yes, Deborah S recommends this product! Living in a very cold winter climate my little Yorkie needed a fashionable jacket for walks. The purple is cute and the style is very fashionable. i love the bright colors these come in. For those other crazy parents that color coordinate their pets, these are perfect!!! The purple is bright and doesn't fade and the green is also very bright. the jacket itself is good quality and the seems are holding strong even though my dogs put them through hell. I almost bought it in all the colors i love it so much. LOVE BAXTER BOO!!! REFER ALL OF MY FRIENDS!! !